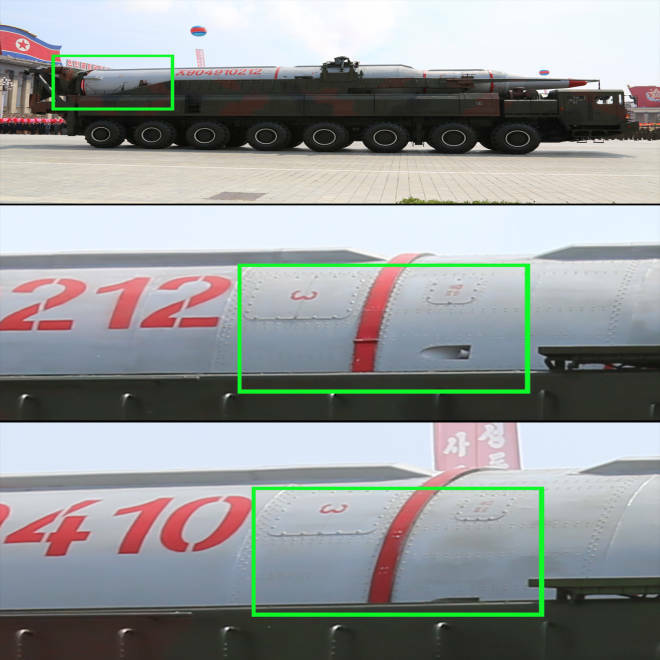 A photo montage from a July 26, 2013, military parade in the North Korean capital of Pyongyang shows a purported Hwasong-13 intercontinental ballistic missile, with the area where retro rockets should be mounted highlighted, along with close-ups showing that forward nozzles on the rocket bodies of two individual missiles were placed in different positions. PYONGYANG, North Korea -- Missiles paraded through the streets of Pyongyang in recent displays of North Korean military might -- said to be capable of hitting targets throughout Asia and even in the U.S. -- are incapable of flight and are almost certainly nothing more than fakes, according to U.S. government experts and independent analysts. "My opinion is that it's a big hoax," Markus Schiller, an aerospace engineer in Munich and former RAND Corp. military analyst, said of the intercontinental and medium-range missiles displayed in the North Korean capital in April 2012 and again two weeks ago. U.S. government experts, having reviewed unclassified images from the most recent parade on July 27, including high-resolution photos provided by NBC News, agreed. “Our assessment is that what we are looking at is most likely simulators used for training purposes,” according to a statement to NBC News. The experts, who spoke on condition of anonymity, would not discuss the methods used to make their determination. U.S. and other Western officials have recently expressed concerns over North Korea’s advances in building nuclear weaponry, but many are doubtful that its secretive missile program is capable of delivering such weapons outside a limited area in east Asia. There also are signs that the missile program may be in disarray, including a failed attempt to launch a satellite in April 2012 and the recent disappearance from public view of Pak To-Ch’un, the Politburo member who managed North Korea's weapons production, including its missiles. “That the guy in charge seems to have been purged is the clearest indication we’ve seen so far that they’re having some problems,” said Alexandre Mansourov, a Korea expert and visiting scholar at Johns Hopkins University. A spokesman for North Korea's U.N. Mission in New York did not immediately respond to a request for comment. NBC News asked U.S. government experts and independent military analysts, in the U.S. and overseas, to examine high-resolution images of the Musudan medium-range missile and the ICBM, known as the Hwasong-13, taken at the July 27 military parade. The consensus: The displayed missiles were built for show, not for flight. Schiller, who wrote a detailed report questioning advances in North Korea’s missile program last year, said that images were just as unrealistic as those he saw when the Hwasong-13 made its debut in at an earlier parade in April 2012. For example, he noted, there was no evidence on the rear of the Hwasong-13 of retro rockets necessary to separate the stages – critical if an ICBM is to reach sub-orbital space and strike distant targets. Schiller also said varied features on the rockets – such differing placement of small guidance nozzles and hatches – are telling. They make him believe that these are not even training "simulators" but "crude fakes." Schiller said the North also seems to be trying to inflate the number of Hwasong-13s it claims to possess. "I can tell that on the mock-ups, they simply changed the markings and serial numbers from last year's parade to make it look like they have more missiles," he said. 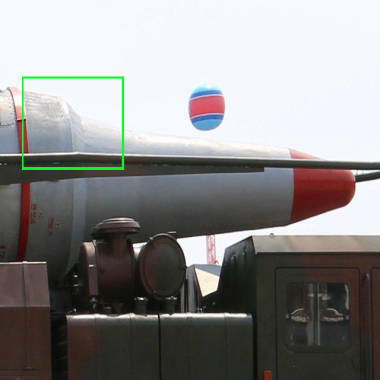 Highlighted section shows "undulating skin" near the nosecone of a North Korean rocket from the July 26 parade. James Oberg, an NBC News space and missile expert who traveled to North Korea in April 2012 to observe the satellite launch that ended in failure, pointed to another discrepancy that would make the missiles less airworthy -- "undulating skin" near the warhead on one. "Upper-stage missile skin has got to be really smooth, or else it sets off high-speed turbulent air flow that can both heat the region – and the hardware inside it – and also create localized drag effects that can pull the missile far off attitude (direction), or even pull it sideways and thus lead to loss of control and disintegration," he said. Experts also note that neither the Hwasong-13 nor the Musudan, a ballistic missile ostensibly capable of reaching targets up to 2,200 miles away that has purportedly been around for 10 years, has ever been flight tested. "The fun thing is it never left the ground," Schiller said of the Musudan. "… Imagine Lockheed building a fighter jet and it never flew!" The Musudan was at the center of this spring's Korean missile crisis. For three weeks, two Musudans sat, fully fueled, on a launch pad overlooking the Sea of Japan. The North threatened to test them, but ultimately backed down. Mansourov, the Johns Hopkins scholar, told NBC News that technical problems with the Musudan – not political pressure – led to the roll-back. Mansourov and other experts caution that while the North has been having problems, that doesn’t mean the North Koreans don't have a significant long-range missile program edging closer to success. Norbert Brugge, a German missile engineer who also studied the parade imagery, and others suggest that even if the parade missiles are fake, the North may have real missiles that it has has not shown or tested. "There are real missiles, not mock-ups!" he said in an email to NBC News this week. Victor Cha, who directed Asian affairs for the National Security Council during the George W. Bush administration, thinks the assessment may permit the Obama administration to put North Korea on the backburner at a time when other issues, like Egypt, are more pressing. "Some thought the Musudan and [Hwasong-13] development might put pressure on the U.S. to come back to the negotiating table," said Cha, who wrote extensively about the missile program in his book, "The Impossible State: North Korea." "This gives them some breathing space, if you will." Why Pyongyang would show off phony missiles if it had real ones is anyone’s guess. But David Wright, director of the Union of Concerned Scientists’ Global Security Program, thinks that the North probably believes it can gain domestic prestige and, possibly, diplomatic leverage at the same time. And even though the U.S. has seen through the ruse, it could be a potential positive for U.S.-North Korea relations, Wright said. “My sense is that (the assessment that the missiles are fakes) could embolden the U.S. to open direct negotiations with the North,” he said. Despite the apparent fakery, Oberg says North Korea should not be taken lightly, citing his experience last year at its space launch facility and the fact that it finally succeeded in launching a rocket into space in December. "So much of what we were shown -- factories, retail stores, farms -- were 'Potemkin' facades, it's tempting to relegate all their paraded weapons to the same fantasy land," he said. "But with the big rocket, they did place a satellite into orbit, and other nations confirmed it. You can't bluff and bamboozle your way into outer space." Robert Windrem is a senior investigative producer for NBC News; M.L. Flynn is senior producer of editorial strategy for NBC News. She traveled with NBC News National and International Correspondent Ann Curry to Pyongyang last month.